This course o ers a comprehensive introduction to the history and growth of the ancient Roman empire from the early settlements in Latium, through the republican and imperial periods, to the formation of a new Roman world after the crisis of the 3rd century. A series of themes and issues will be explored: the range of primary sources available for ancient history; the political organization of the Roman state; the territorial expansion and its in uence on the cultural and administrative sphere; Roman religion and the spread of Christianity; the Roman frontiers and the barbarian populations; and the end of the Roman world and the birth of a new society. In order to stimulate students’ critical skills in observing historical phenomena, a problem-oriented approach will be supported by readings of primary sources. Students will also have the chance to observe di erent approaches to understanding the past and will develop a sense of the role of historians and history in society. Once dismissed as the “Dark Ages” of invasion and destruction between the fall of ancient Rome and the rise of the medieval communes, the period has become the focus of intense scholarly activity and debate. Thanks to excavations in towns, villas, cemeteries, churches and castles, a vastly more dynamic picture has emerged for Italy from Late Antiquity and the Early Middle Ages (circa 300-1000 CE). Exploiting new data and nds, together with secondary studies and literary sources, this course o ers an overview of the archeological evidence and history of one of the most vital and complex periods in all European history. The stress is on continuity and major changes that occurred in the peninsula after the collapse of the Western Roman Empire. 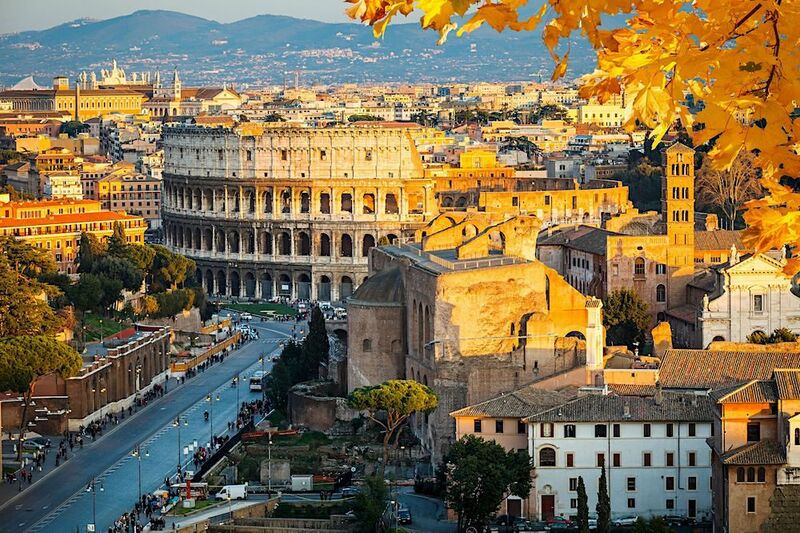 The medieval remains in Rome and northern Latium are outstanding. Course topics include: archaeology of various typologies (domestic, settlements, churches, monasteries, burials, defensive structures); speci c cultures (Ostrogoths, Lombards); inscriptions; conservation and reconstruction; distinctive object types; basic analytical methods of various materials (pottery, metal, glass, wood, stone). Activities include visits to museums in Rome and Tuscania (special laboratory), and to two excavation sites. This upper level course examines the major developments in the art and architecture of ancient Rome from the foundation of the city to the age of Constantine, with an emphasis on signi cant examples of Roman monumental buildings and works of art, crucial archaeological sites, and newly excavated areas. In addition to introducing students to analysis and interpretation of styles, this course addresses a variety of current themes and topics such as public and private architectural spaces, urban planning, traditions, innovations, patronage, past and current meaning of Roman art. The emphasis is on investigating Roman art and architecture in relation to cultural, political, social, and economic developments and through an interdisciplinary approach. To facilitate the understanding of the multifaceted aspects of Ancient Rome, conventional classroom lectures are supplemented with eld trips to museums, archaeological sites, and excavations in progress. The traditional stories about the Greek gods and heroes have always been a fundamental part of Western art and literature, especially since their “rediscovery” by Renaissance humanism. A selection of the great works of ancient Greek literature will present the most important stories, and will also show how the Greeks used myth to express the traditional ideals and personal re ections that captivated and shaped subsequent European culture. The pictorial narratives, so common in Greek and Roman monuments and objects, will introduce the sophisticated visual language created by the Greeks to tell such elaborate tales, the rst such iconographic system and one which was to some extent “revived,” together with the gods, heroes and heroines, in Renaissance art. To know Roman mythology and understand its similarities and di erences with Greek mythology is to understand the real essence of the ideals and aspirations of a great people that built a great empire. In particular, Virgil and Ovid, the most widely known writers of Roman mythology, and also other Roman writers, will help students develop a new interest for Roman myth, history and art. The course is a general overview of ancient literature through the analysis and comparison of some of the oldest works of Western civilization. Through a reading of the most signi cant chapters of the Iliad and the Odyssey, students will get in contact with the aristocratic world and heroes described by Homer in 8-7th century BCE, in order to reconstruct the society of early Greece in the Mycenaean period. The stories presented in the Iliad and Odyssey, considered the “Bible” of classical civilization, show how Greeks used myth to express archetypal values which became immortal for successive generations. Myths are analyzed not only as amazing stories but also as bearers of important messages about life within society, and as primary forms of communication and instruction in a non- literate and oral society. The great in uence of Greek myths on Roman legends will also be seen through the reading of some passages of the Aeneid - the national poem of Rome written by Virgil in the 1st century BCE - focusing on the link between Roman history and Greek tradition. The hero of the work, Aeneas, was the survivor of the fall of Troy and the ancestor of Rome’s leaders. A comparison between Aeneas’ and Odysseus’ wanderings will conclude the course. This course investigates the history of ancient Rome primarily through its monuments — its architecture and urban form. We will consider the mythology of Rome as caput mundi (“the head of the world”), as well as the physical city and its infrastructures in antiquity, from the 8th century BCE to the 5th century CE. Signi cant architectural examples and monuments will be studied in their original historical, social and cultural context. The ways in which power was expressed symbolically through building projects and artwork will be addressed during classes, which will be held mostly on site in the city and its environs. Key archaeological sites and museums in and around the city of Rome will also form part of the program. The course aims to study and explore the darkest, deepest places beneath the city of Rome: there the still-extant underground web of galleries, shrines and basilicas built during the Early Christian and Early Medieval centuries (approx.150-900 CE). Thanks to a number of lectures and on-site classes, students will be able to understand the birth and a rmation of the Christian religion in the capital city of the pagan Roman Empire. Study of archaeological sites and material culture are an essential part of the course, which includes class visits to many sites including the Vatican necropolis beneath St. Peter’s, the catacombs of St. Sebastian, and the basilica of San Clemente.